Clusters of fragrant, pure white flowers from June to September among small, lustrous, dark green leaves, often bronze-tinted in cold weather. 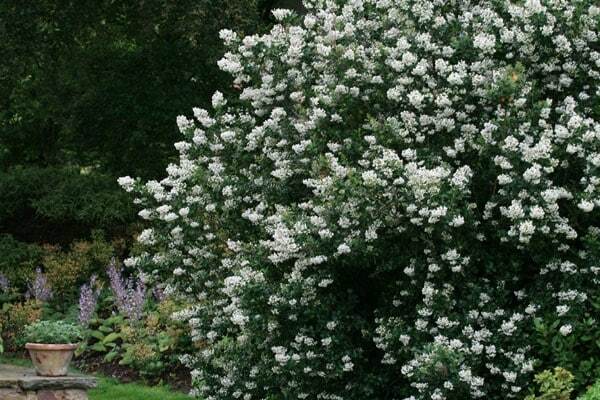 This upright, evergreen shrub prefers a sheltered, sunny site with fertile, well-drained soil. To fully appreciate the wonderfully scented flowers, it's best grown in a border close to an entrance or path. Glossy dark green leaves and a profusion of white flowers in summer. It made strong growth in its first year and coped well with summer drought conditions. I am using it to give height at the back of a mixed shrub and herbaceous border. Provided the pot is really large and you make sure the plant is kept well fed and watered, then this should be fine. I have had this shrub for about 2 years and although it is growing and the leves are nice and shiny it has never flowered. Why would this be? Hello, There are a number of reasons why plants don't flower including too much shade or not enough water or nutrients. It can also be caused by the plant putting on new root growth instead of focusing its energies on producing flowers. I am not really sure why yours has not produced buds, but given time and the right conditions, there is no reason why it wont flower. You can often give them a bit of a push by feeding during the growing season with a high potash fertiliser. Thanks - what would you recommend I feed them with? What size pots/ height plants should I get to fit this width?